The Vail Valley Foundation on Monday announced it has promoted Tom Boyd, Director of PR and Communications at the organization, to a new role as Director of PR & the Gerald R. Ford Amphitheater. The promotion puts Boyd at the helm of the Ford Amphitheater, Vail’s iconic seasonal performing arts venue, as it enters its 32nd year in operation. Boyd will also continue with responsibilities for strategic PR and communications for the Vail Valley Foundation, which he has managed since coming to the organization in 2015. Boyd’s roots in the valley run deep: he is a born-and-raised Vail local who has been active in the culture of the Vail Valley community as a musician, as an arts and entertainment writer, and most recently in his roles and responsibilities at the Vail Valley Foundation. Boyd follows in the footsteps of former Director Jennifer Mason, who he said was instrumental in bringing the Ford Amphitheater into a new era. Mason was Director of the Ford Amphitheater for 16 years before stepping down in January to take the role of Executive Director of the Colorado Snowsports Museum. “It’s impossible to put into words just how much work, time, and care Jennifer Mason and her team have given to the Ford Amphitheater in order to put this venue on such exceptional footing,” Boyd said. With the exception of Mason, the Ford Amphitheater will welcome back all of its previous staff, including Lauren Gary, who managed Box Office operations and will now serve as Assistant Director of the Ford Amphitheater. “Lauren Gary is perhaps the most knowledgeable person we have on staff in terms of the intricacies of our performing arts venues, and we are very pleased she will be stepping into this new leadership role for the company,” Johnson said. Gary is originally from Scarsdale, New York, and has been full-time with the Vail Valley Foundation since 2015, and part-time since 2010. Boyd was born and raised in West Vail and is the son of Susan Boyd, former Director of the Vail Public Library, and the late Steve “Louie” Boyd, who was one of Vail’s original ski patrolman and built many of Vail’s early homes. 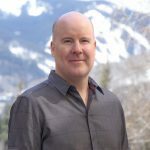 He graduated from Vail Mountain School in 1993, and has a bachelor’s degree in philosophy from the University of Colorado. Boyd worked for his father and brother, Steve Boyd Jr., in residential and commercial construction before becoming a journalist and editor for publications like the Vail Trail, the Denver Post, the Rocky Mountain News, Ski, Skiing, and 5280. He also worked in media operations at Olympic and other international sporting events in Italy, Canada, Austria, China and elsewhere from 2006-2014. Boyd’s professional music career began while still a student at Vail Mountain School, playing his first gig as a drummer at Cassidy’s Hole-in-the-Wall in 1992, then later as bass, guitar, and vocals in the mountain music scene until 2012. While living in Denver in 2010 he co-founded a solar company called Nokero, where he was Chief Marketing Officer, and helped the company bring in more than $2m in sales in more than 24 countries in its first two years. In 2015 he returned to the Vail Valley to work as a media specialist for the Vail Valley Foundation. Boyd lives in Edwards with his wife, Renee, and their two sons, Tyler Douglas Boyd and Alexander LaRue Boyd. Sept. 5: Whistle Pig Vail: Gary Clark Jr.
*The final Bravo! Vail performance at the Gerald R. Ford Amphitheater is July 24, however the Bravo! Vail schedule continues at other venues.